jabs is an artist duo comprised of Jasmine Gui (writer) and Abby (visual artist), working primarily in text and paper mediums to creatively interrogate and imagine space. Their work is largely collage-based, considering paper as both material and medium to think about art. Jasmine is a word-based multidisciplinary artist who has published poetry in print, digital and audio formats. Her poetry is an intersection of languages, sound, and moodscapes that are interested in creating silence and pause. Abby is a multidisciplinary artist whose dominant mediums are sculptural drawings, paper cutouts, and painting. By concealing and revealing elements on layered paper, her work captures moments of quiet happenings. With precise and delicate linework, Abby’s practice combines ephemerality with laborious intricacy. “Sp l it” uses land settlement, formation, development and representation and as touchstones to consider land and water as archive and its absence. Water reveals but also conceals. It connects and severs within a single ebb and flow rhythm. The islands, throughout history have seen such rhythms. Using a research methodology to reconstitute found items into archival topography, we will be creating a diptych installation. Jasmine’s practice will use found articles drawn from research as a basis for blackout poetry and collage poetry to evoke the visual interrogation of alternative archive. With Abby’s visual work, we create filters of access and fluidity in the visual form of layers. Through “Sp l it”, we wish to interrogate pasts, recognize presents and imagine futures through hybridity, both in form and content. 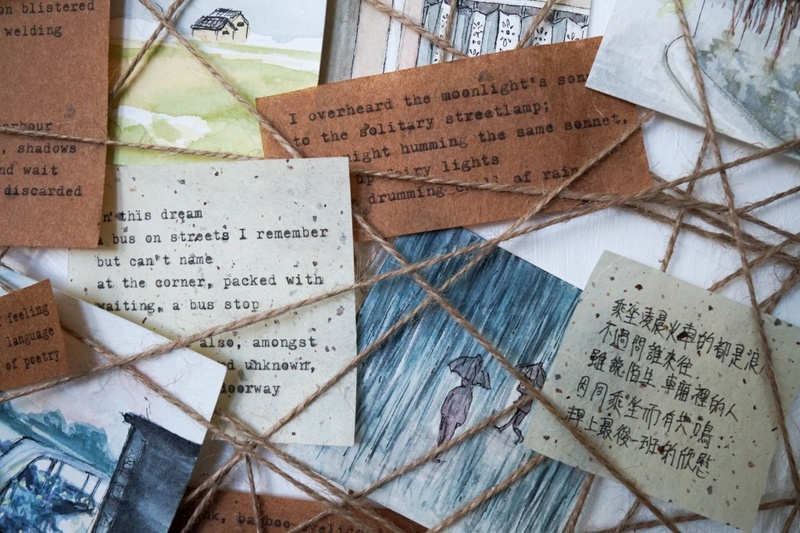 This mixed media installation features pulped paper, acrylic, found items and text/image creations to view the shoreline as an alternative archive, one that keeps its own crucial lack / absence in view. From the shifting topographies of the islands and islets over time, to the erosion of Tkaronto’s coastlines, how can the memory of land and water help us better understand our histories and therefore our futures? Born in Singapore, raised in Suzhou and Hong Kong, Jasmine Gui currently lives and works in Toronto. She is the founder of Project 40 Collective, a pan-Asian interdisciplinary artist collective, and managing editor at LooseLeaf magazine. She holds an MA in English, Diaspora and Transnational Studies from the University of Toronto. Her work has been featured in publications such as The Spectatorial, Panorama Journal, Softblow, ricepaper, and Hart House Review. Her poetry chapbook, boke was published in 2017. She is currently working on a full length manuscript. Abby Ho is community arts organizer and multidisciplinary artist, based in Toronto. She graduated from OCAD with a BFA in Cross-Disciplinary Art: Life Studies, and is the artistic director at Project 40 Collective and managing editor at LooseLeaf magazine. Working mainly within sculptural drawings, paper cut-outs and painting, her work captures moments of nostalgia and quiet happenings. She has curated no-sto, in flux, and hui.